China is known as the birth place of Tea. There are six varieties of ‘tea’ which come from the Chinese Camellia sinensis tea plant – green tea, black tea, white tea, pu-erh, oolong and yellow tea. In addition, a wide variety of Chinese herbs and flowers are drunk as teas; many are used for medicinal purposes, whilst others are enjoyed for their flavour. 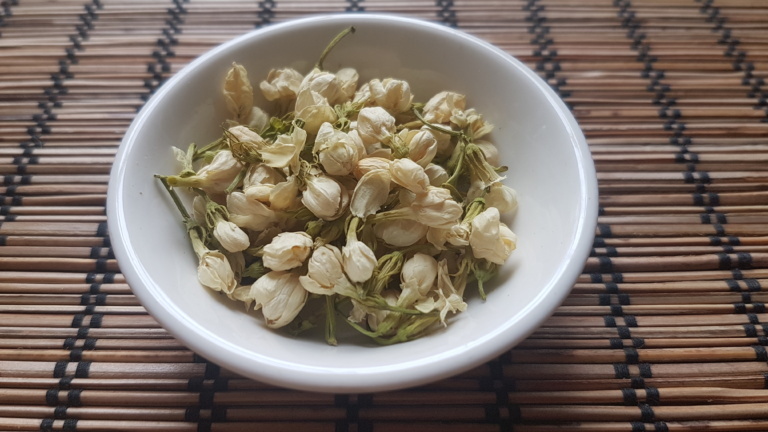 Jasmine tea as we know it in the west is more commonly a green or white tea that has been scented with fresh jasmine blossoms during the final drying process rather than just the pure jasmine blossoms. Both are widely drunk all over Asia as jasmine tea is believed help to balance body heat, clear eyes, detox the liver, relax the body, improve circulation, lower cholesterol, improve digestion and fight off flu. With so many perceived health benefits and a great taste we can see why it’s so popular! Like many pure teas you can buy different grades of Jasmine tea. Green or white tea that has been scented will always taste better than other cheaper options that have been sprayed with Jasmine oils. Contrary to popular belief pure dried jasmine blossoms to not retain their signature scent and flavour. We offer three different jasmine teas ranging from an everyday scented Jasmine Green tea, to a higher grade jasmine green tea and finally Jasmine Dragon Pearls. This would be considered the Champagne of jasmine teas as each pearl of scented white tea is made of the finest silver tips and hand rolled to give a pure, delicate cup of tea. This floral tea has been popular in China for hundreds of years. There are several different varieties of Chrysanthemums that are used for tea that range from being very pale in colour to more vibrant yellows. It has a very distinct floral flavour that is very pleasant to drink either after a meal or in the evening as an aid to relaxation. In Chinese medicine it is believed to protect our eyes and promote eye health, help clear acne, relax the body and mind and have strong antibiotic effects. The Osmanthus plant has been cultivated in China for over 2,000 years and has been used as a medicinal plant for just as long. 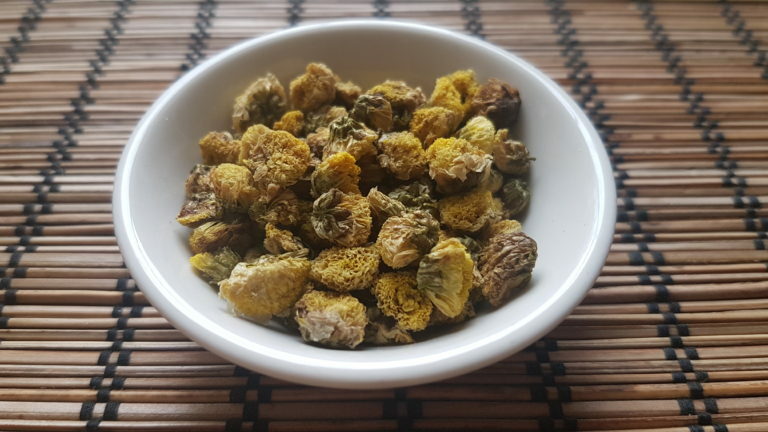 Like Jasmine tea, Osmanthus flowers are often drunk either as a blend with teas like green tea and oolong or drunk on their own as dried flowers. It is believed to improve complexion, boost the immune system, help with menstrual pains, and reduce phlegm. It is not uncommon to find other consumable products to be flavoured with Osmanthus, including a wine that we found in our local Asian supermarket (located in the Corridor in Bath!). If you’d like to try a delicious high quality Osmanthus oolong we currently have Gui Hua Oolong, an Osmanthus scented Taiwanese Oolong. Although Hibiscus is not native to China it has become a very popular herbal tea over the past few years. It’s known for having a diuretic effect, and is believed to help lower blood pressure and support digestion. It’s also, rich in Vitamin C and can have a soothing effect on a sore throat. 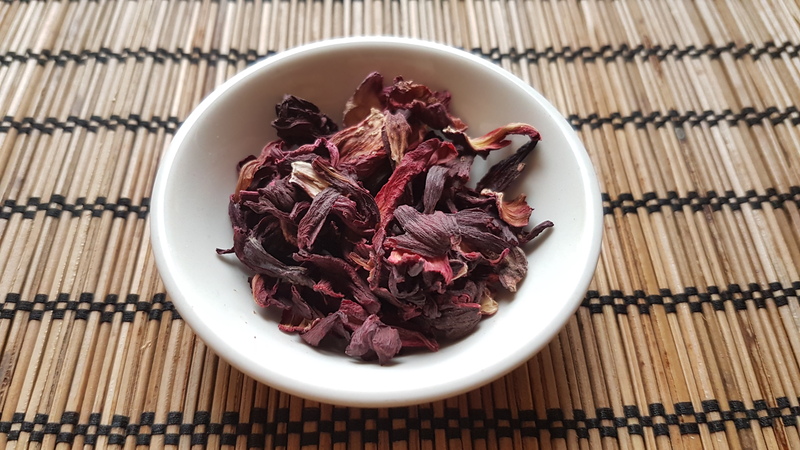 Hibiscus can be drunk on its own, but often it is used in flavoured tea blends. This is because it can help balance flavour and adds a rich red tone to the tea. Rose is one of the more well known flowers on this list and is used in a variety of products from soups to perfumes, a variety of different foods, like Turkish delight, to alcohol to tea. Whilst the delightful scent and taste of rose is popular in the west, it has been used in Chinese medicine for thousands of years. It is used in Chinese medicine as an aid to menstruation cramping. 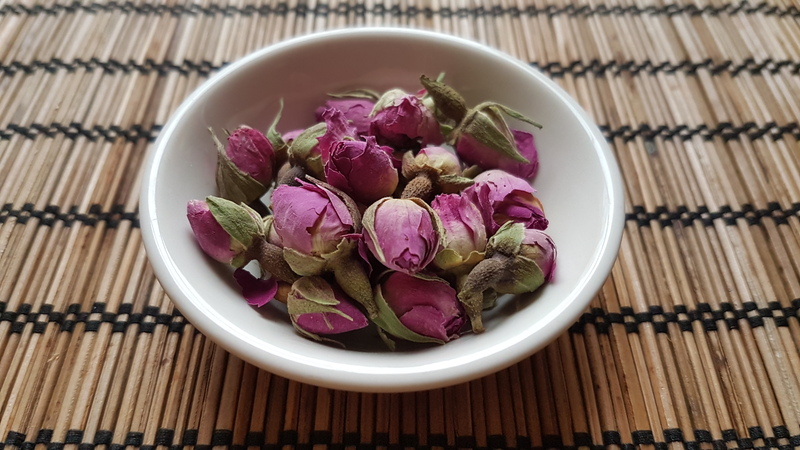 Rose buds on their own give a very light and delicate infusion which can be very calming and perfect for an afternoon tea. They are also used in tea blends and can be found in our rose black tea and rose earl grey, as well as other less traditional blends like good morning sunshine. Flowering teas or blooming teas are incredibly special. These tea balls may seem pretty unassuming upon first glance, but once they are dropped into hot water they bloom to produce a wonderful display of flowers of tea leaves. Each balls is hand made by sewing each individual flower and leaf together in a knot. When the ball reacts to the hot water the knot is loosened revealing the intricate arrangement within. An individual flowering tea ball takes around half an hour to make. Generally they are made from either green tea or white tea along with traditional Chinese flowers such as jasmine blossoms, lily, globe amaranth, chrysanthemum, hibiscus and osmanthus. The taste will vary depending on whether the tea leaves have been scented or not. We offer a selection of four different flowering teas. Each uses white tea as its base giving a delicious delicate pot of tea and a beautiful display of flowers. Flowering Teas from Left: Divine Lily, Love Heart, Family Fortune and Sacred Flowers.